Sebastian Knight is one of my favorite Nabokovs, despite the ways in which it might be clumsy. It strikes me now as a sort of compendium of Nabokovian tricks, a show of technqiues he'll use for the rest of his career. As the man in Paris may have said, “Nabokov seemed to him to be constantly playing some game of his own invention, without telling his partners its rules.” Is Sebastian Knight really about identity or literature? Maybe. It seems to me that it's a grand parade of interlocking facades, and like a lot of Nabokov's books (Pale Fire, Transparent Things, Invitation to a Beheading) I find myself wondering what exactly is supposed to be hiding behind all the facades and word games and Hamlet jokes. I do love the way, after "V" describes the structure of Knight's novels, Sebastian Knight's own structure takes on the features of the fictional novel just described. Who but Nabokov could pull that off? Who but Nabokov would have thought of such a thing? 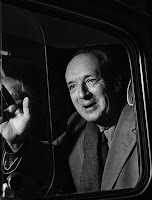 I can only allow myself to read one Nabokov a year, because I have the same response to every one of his books: at first I am dazzled an then I am annoyed, because Nabokov can't help self-consciously pointing out that he is dazzling me and that, odds are, I'm unworthy of his efforts. Long, off-topic digression. Apologies. You really drew out the notion of "fictitious biography" for me in your discussion of Sebastian Knight. This made me think about the way that Sebastian Knight wears his own fiction as a mask of sorts, hides behind his own stories; the narrator then adopts a double mask. What I love about Nabokov is how he really complicates the line between the word and the world, and shows how the word not only speaks of the world, but creates the world, renders the world worldly. If the narrator and SK are indeed the same person, and "V" only comes to this awareness by the end of the novel, it seems that Nabokov is playing, once again, with the narcissistic hero who, like the mythical Narcissus, doesn't recognize his image in the pool as his own, and falls in love with that rendered-strange or othered image of himself. I think we also see this happening in Despair.